Description EHT 1864 is a potent inhibitor of Rac family GTPase with Kd values of 40 nM, 50 nM, 60 nM and 250 nM for Rac1, Rac1b, Rac2 and Rac3, respectively. 10 μM EHT 1864 shows a complete inhibition of GSIS (Glucose-stimulated insulin secretion)and inhibits GSIS at 10-20mM glucose. It also suppresses a glucose-induced membrane association of Rac1 and glucose-induced ERK1/2 phosphorylation and activation. 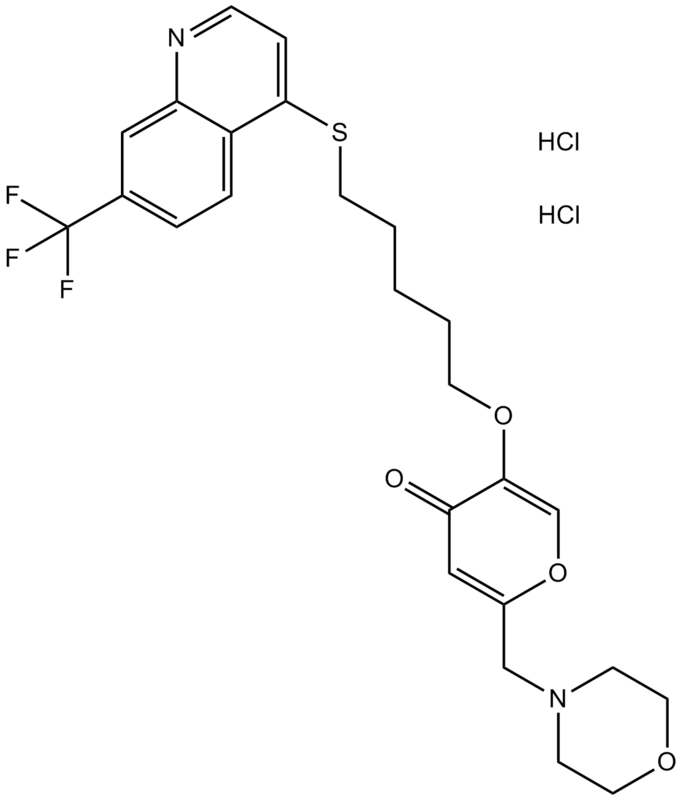 EHT 1864 is a small-molecule inhibitor of Rac family small GTPases with Kd value of 40nM for Rac1 . In NIH 3T3 mouse fibroblasts, EHT 1864 treatment shows an 80% reduction in PDGF-induced lamellipodia formation. EHT 1864 at concentration of 50μM can completely inhibit the complex formation between Rac1 and PAK-RBD and cause the release of nucleotide from Rac1. The reassociation of nucleotide with Rac1 induced by EDTA or the Tiam1 can also be blocked by EHT 1864. EHT 1864 is most potent to Rac1, both in the binding affinity and stimulation of nucleotide release. It binds to Rac1b, Rac2 and Rac3 with Kd values of 50nM, 60nM and 250nM, respectively. Moreover, EHT 1864 can suppress cellular transformation induced by Rac1 with an 80% inhibition of focus-forming activity .